In September last year, it was confirmed by Machine Head frontman Robb Flynn that guitarist Phil Demmel and drummer Dave McClain had quit the band. The pair took their final bow after Machine Head's Freaks & Zeroes North American tour which came to an end in November. Now Demmel has spoken about the split and says Flynn essentially turned the band into a “solo project” and reports that he wasn’t happy with the way that the Catharsis album turned out. He tells the Talk Toomy podcast: “I’m not going to badmouth the breakup or Robb. I think he's an amazing musician and the times I had in Machine Head were awesome. The last few years just weren't. We just didn't work as people anymore. 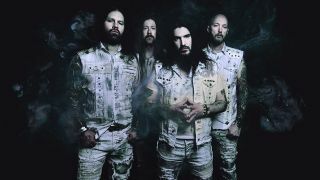 Demmel also goes on to say that he’s not a fan of Machine Head’s last album Catharsis, saying: “I hate the last record. There's moments of what I wrote that I like. I wrote most of the music to California Bleeding, but Robb wrote the lyrics on top of it that. “So, I think, in that sense, it just became a Robb Flynn solo project, and that isn't what I signed up for. “The last few years were basically collecting a paycheck – and I just couldn't do that – the stress and all the talks and the ‘can't do this,’ ‘don't do that,’ ‘don't stand there,’ ‘don't say this,’ ‘don't sing the words to the audience,’ don't point.'" However, Demmel says he thinks that Flynn “was just as done with me as I was with him,” adding: “I think I kind of did him a favour by not having him have to fire me. Since quitting Machine Head, Demmel stepped in for Slayer for a run of live shows after Gary Holt returned home to look after his ill father. He’s also resurrected his VIO-LENCE project, while McClain has now rejoined Sacred Reich.